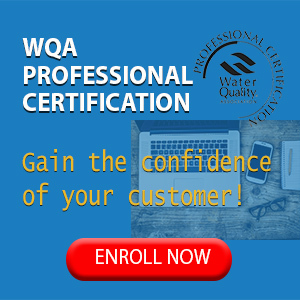 QMP, Inc. has been awarded WQA Gold Seal certification for its newest four-stage RO system, the QMPAlkaRO-75, which also re-mineralizes permeate water, adjusts pH to an alkaline state and provides a negative ORP. Voltea has continued its global expansion by partnering with Texchine, a South Carolina-based distributor and reseller of equipment for commercial laundry, cooling tower and general water treatment industries. Voltea’s water desalination technology, CapDI®, has now made its way into the Australia and New Zealand markets. This expansion represents four continents of successful integration, including Asia, Europe and North America. Hydrasyst, a water technology company that provides sustainable energy and water treatment solutions, will be a distributor of Voltea’s water softening technology for commercial laundry and cooling towers in commercial buildings and shopping centers where controlling TDS lowers operating costs and environmental impact. Calgon Carbon Corporation announced that the Department of Commerce (DOC) issued new tariffs on steam activated carbon from China ranging from $0.018 to $1.10 per pound. These rates were based upon a review of prices of Chinese activated carbon imported into the US from April 1, 2012 to March 31, 2013. These announced tariffs may be modified to correct any errors made by DOC. The average duty is $0.018 per pound, which replaces the average tariff rate of $0.07 that had been in effect. Calgon Carbon’s tariff with respect to product it imports into the US from China will be $0.018. Revision of the tariff rates has two effects. First, these new rates become the cash deposit rate applied to future imports. Also, if a company deposited less than its new tariff rate on carbons imported during the period of review, it will be required to pay additional duties; conversely, if it deposited more than the new rate, it will receive a refund. Building on last year’s growth of 4.7 percent, bottled water will again post significant increases in both sales and consumption for 2014, according to preliminary data from the Beverage Marketing Corporation (BMC). While other beverages struggle to gain or maintain market share, bottled water is expected to have a 7.4 percent increase in 2014—that equates to 10.9 billion gallons, said BMC’s Director of Research, Gary Hemphill. Sales of bottled water in 2014 are expected to grow to $13 billion, an increase of 6.1 percent from 2013. The Water Environment Research Foundation (WERF) launched its third project under the US EPA-funded National Research Center for Resource Recovery and Nutrient Management by awarding the University of California-Berkeley and Stanford University with a contract to research extractive nutrient recovery technologies. This project, Enhanced Removal of Nutrients from Urban Runoff with Novel Unit-Process Capture, Treatment, and Recharge Systems (WERF project # STAR_N4R14), assumes that compared to traditional approaches, implementation of process models to aid future design efforts for urban stormwater runoff capture and treatment will significantly enhance nutrient removal at the watershed level. These models will also help meet community-defined priorities including flood risk mitigation, capture for groundwater recharge and water quality improvement. Biwater and NeoTech Aqua Solutions have been selected for Padre Dam Municipal Water District’s new water reuse demonstration plant. The plant will leverage state-of-the-art UV technologies for a safe, reliable, drought-proof and environmentally sound solution to the region’s water woes. The facility is designed to explore the expansion of an advanced water purification project to treat 10 million gpd (37.8 million liters/day) of wastewater to potable water quality standards for select communities in San Diego, CA. 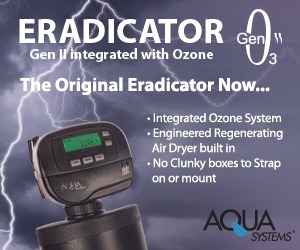 The plant will utilize free-chlorine disinfection, membrane filtration, RO and NeoTech Aqua’s UV technology in conjunction with advanced oxidation. Demand for membranes in the US is projected to increase 7.9 percent per year through 2018 to $6.2 billion (USD). Advances will be driven by factors that affect the water and wastewater industries, which will record the largest gains through the forecast period. In the more mature municipal segment, growth will stem primarily from demand for replacement membranes for the large existing base of membranes in use, but will also receive a boost from use in desalination plants. These and other trends are presented in Membrane Separation Technologies, a new study from The Freedonia Group, Inc. Microfiltration membranes accounted for the largest share of membrane demand with a 40-percent share in 2013. RO will be one of the fastest growing membrane types, advancing at an 8.6-percent annual rate through 2018 to $1.6 billion. 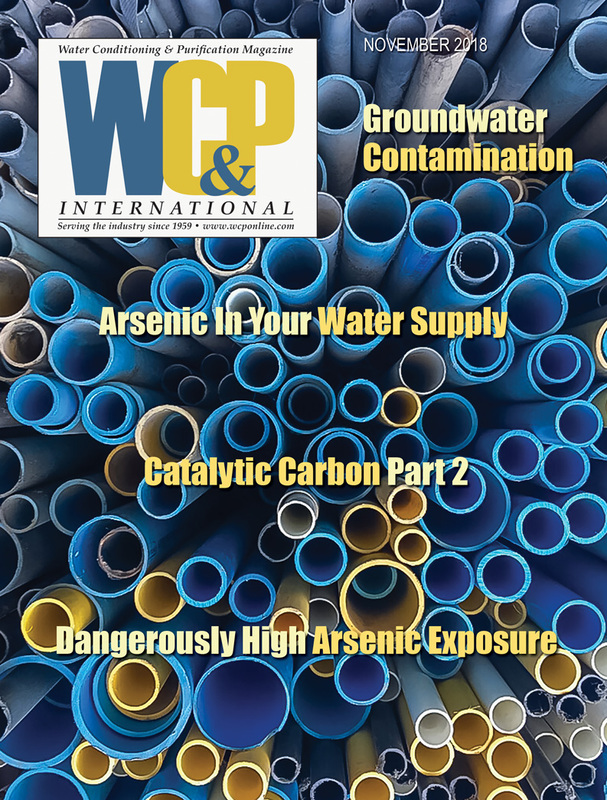 Of the various markets in which membranes are used, water and wastewater treatment accounts for the largest share, with 48 percent of sales in 2013. For further report details, contact Corinne Gangloff at (440) 684-9600 or email pr@freedoniagroup.com. The International Activated Carbon Conference and Courses (IACC) is accepting nominations for 2015 Activated Carbon Hall of Fame awards. The award recognizes outstanding contributions in the carbon field: new products, test methods, education, stewardship, etc. Awards will be presented at the two 2015 IACC in Orlando, FL in February and Pittsburgh, PA in September. Awardees will provide a plenary talk at the conference. Information is available at www.pacslabs.com or questions may be directed to Henry Nowicki at (724) 457-6576. Running over two days in early November, WWEM 2014 was an outstanding success, with sustained growth in every event since the first WWEM in 2005. In comparison with WWEM 2012, visitor numbers were up by 15 percent. Even though the size of the exhibition was increased by 12 percent, the organizers were unable to accommodate several potential exhibitors. 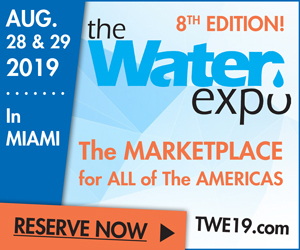 WWEM 2014 focused on water, wastewater and environmental monitoring and was comprised of a wide range of activities that were designed to update and inform anyone in the water sector with a professional interest in testing and monitoring. Carr Supply has opened a new branch in Lima, OH, providing high-quality plumbing, heating/ventilation/air conditioning and water service supplies and equipment to contractors in a five-county area of northwest Ohio. The company is part of Dayton-based WinWholesale Inc., one of the nation’s largest distributors of residential and commercial construction and industrial supplies and materials with more than 560 location in 45 states. Ottawa, Ontario-based Clearford Water Systems Inc. purchased a 91-percent interest in UV Pure in October. The transaction was expected to close on or before December 10. According to UV Pure President and CEO, Rick VanSant, Clearford and UV Pure have worked together commercially since 2012. Clearford, a long-standing UV Pure customer, uses the company’s patented disinfection systems as the final stage in its wastewater treatment solution. Clearford is also UV Pure’s exclusive distribution partner in the Colombian market. Western Canada’s two-day CIPHEX West trade show, which took place in Calgary in November, attracted more than 3,100 visitors including contractors, wholesalers, engineers, designers, builders, developers, government and municipal representatives and more. CIPHEX West is produced for the industry by the Canadian Institute of Plumbing & Heating, with support from the Canadian Water Quality Association, the Mechanical Contractors Association of Canada, the Canadian Hydronics Council, the American Society of Plumbing Engineers, the Thermal Environmental Comfort Association and the Canadian Association of Pump Manufacturers. Two Cork, Ireland-based scientific organizations, Tyndall National Institute and Environmental Laboratories Services Ltd. (ELS Ltd.), have committed to a collaborative EU Horizon 2020 project (SMARTER-Si) to develop a domestic water quality test device. The device will allow users to rapidly screen for the presence of harmful contaminants, such as chemical and biological hazards, including the harmful E-coli bacteria. The affordable, easy-to-use, portable device will be the first of its kind and will be enabled by technologies developed in the Tyndall National Institute’s Life Science and Sensing & Separation Groups. Those developing the device believe it will deliver results within the hour, which is days faster than current methodologies. In fiscal 2014, Siemens filed 4,300 patent applications—a year-over-year increase of nine percent. In addition, the company intends to boost investments in R&D by around €400 million ($498 million USD). In fiscal 2014, R&D expenditures totaled roughly €4 billion ($4.9 billion USD). Twelve Siemens researchers and developers, who together account for more than 900 inventions and 842 granted individual patents, played a leading role in the company’s success. Krones announced its DecoType machine won the Beverage Innovation Award 2014 in the ‘best technology innovation’ category and its superlight PET bottle won the German Design Award 2014 in the packaging category. In other company news, Krones has acquired a 51-percent stake in Till GmbH, Hofheim. The technology company develops systems for direct digital decoration of containers. The remaining 49 percent of the shares are held by the company’s founders, who will continue to play an active role in the company. Till GmbH machines are modular in design and suited for high-speed applications in the beverage industry and other sectors. LANXESS announced the first phase of a three-phase realignment program will result in a reduction of about 1,000 positions worldwide by the end of 2016— roughly half of which will be in Germany. The affected jobs will be mainly in the administrative and service units, marketing and sales, as well as in research and development. In November, LANXESS initiated the second phase of the realignment program, aimed at increasing its operational competitiveness by focusing on the optimization of sales and supply chains and of production processes and facilities. The relevant measures will be implemented in 2015 and 2016. The third phase of the program will focus on horizontal and vertical cooperation in the rubber business. This phase is also to be implemented in 2015 and 2016. Increased demand for its technical and commercial advice in the UAE and Gulf region has led specialist food and drink industry consultancy Zenith International to open a new regional head office in Dubai. Based in the Freezone area of Jumeirah Lakes Towers, the office will be managed by Zenith’s Regional Director-Middle East and Africa, Gordon Robinson.